A perfect blend of natural minerals from the world´s primary source, the Dead Sea, coupled with state-of-the-art cosmetics technology is responsible for making optimum skincare and protection available directly to you, the discerning consumer. Meticulous processing has produced an ideal balance of oils and salts found only in black caviar for a groundbreaking preparation, using mp269 technology painstakingly developed in the Mon Platin laboratory to encourage dual-stage absorption of vital ingredients, enabling a higher concentration of active ingredients while retaining the delicate texture of the preparation and a light, airy sensation on the skin. 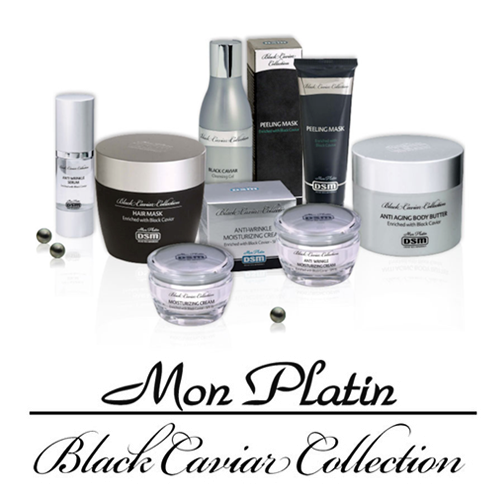 The black caviar product range is generously enriched with all-natural plant extracts based on traditions borrowed from a variety of different cultures and dating back many thousands of years, carefully combined to optimize their health-giving effects. Copyright © 2019 Wild Hare Salon & Spa. All rights reserved. Salon Web Design by StyleNet.